A nice easy walk on to the moors above Leighton and Roundhill Reservoirs before visiting the Druid’s Temple, one of the finest follies in Yorkshire. This was the second in a series of practice walks that I was leading a group of friends from work as we prepared for the Yorkshire Three Peaks Challenge walk. With the A59 still closed at Blubberhouses it still wasn’t practical to tackle one the of the Three Peaks themselves so I decided on this route which was fairly close by and would up the distance to just below the 10 mile mark. Starting from a small layby on the hill below Pott Hall Farm we immediately had a fine view of Leighton Reservoir, one of two reservoirs that have flooded much of the valley of Pott Beck. Walking a hundred metres or so up the road towards Pott Hall Farm we turned left on a track leading to the sizeable dam of Roundhill Reservoir. It was a grey, almost windless day and the waters of Roundhill Reservoir were virtually still. Crossing over the dam we slanted pleasantly up a track above Arnagill. As we climbed higher we began to pass a number of gritstone boulders and outcrops. One particular one looked very enticing but no matter how they tried Kelly and Cath couldn’t find an easy way up. Coming to a junction we turned left for a long, virtually level section across Ilton Moor. Rendered bleak by the murky skies above I thought that I really must come back at the end of August when it would be transformed into a sea of purple heather. At the next junction we forked left for a gradual descent off the moor on a good track to the small village of Ilton. At Ilton we dropped down the steep road to cross Sole Beck. On the other side of the beck we left the road to take a path alongside a wood before climbing up a boggy field to reach High Knowle and then on to Druid’s Plantation and the waiting Druid’s Temple. Druid’s Temple is a folly that was created by William Danby in 1820, originally to provide work for local men during a time of economic depression. 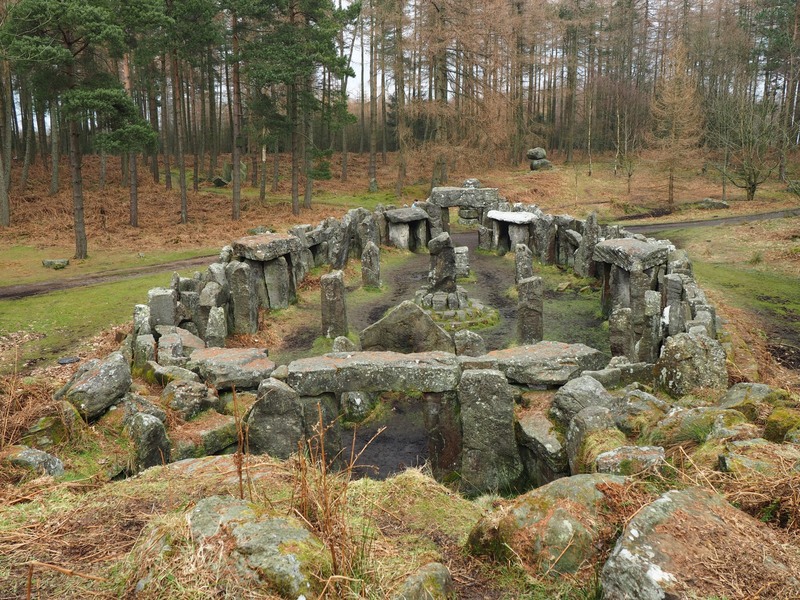 Regardless of its fairly recent origin and how accurate a reconstruction it is of an actual druidic place of worship, there is no denying that it is certainly an impressive and atmospheric monument. Even better for us it was very quiet and so we made use of the large stone table at the back of the temple to sit and eat our lunch. Less impressive was the current landowner’s attempts to create some sort of activity trail around the neighbouring woods. Mainly consisting of random plastic objects, most of them damaged, the strangest attraction was a replica cow with ‘milkable’ udders. Needless to say much hilarity ensued. Eventually leaving Druid’s Plantation behind we briefly followed the route of the Ripon Rowel walk as it passed a corner of Broadmires Wood before descending to a lovely spot where a stone bridge crosses Pott Beck. Crossing the bridge we then climbed up the bank on the other side, passing Leighton Hall to reach the road. The final stage was a simple walk back on the road alongside Leighton Reservoir.